The replicated plaques from World War I will be unveiled at the Cenotaph this Saturday. The ‘Honour Rolls’ are a tribute of respect and gratitude to those who served in the Great War 1914-1918 and will complete the Memorial Cenotaph. 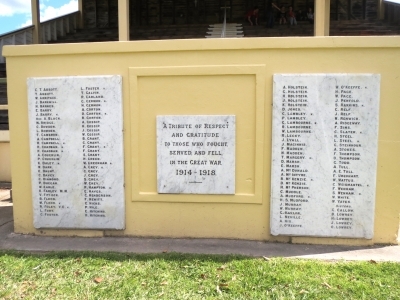 The original plaques will remain in place at the front of the Memorial Grandstand at Stroud Showground. The Memorial grandstand was built in 1924 as a World War I memorial and is a registered with the Australian War Memorial in Canberra. The two plaques on the front entrance of the steps are inscribed with names of all the men and women from the Stroud region who served in the first World War. These plaques have been meticulously replicated and will be placed along side the other memorial plaques at Stroud Cenotaph.